Now that the Grand National has been won by Many Clouds, (much to the chagrin of a certain Minister who had a wager with an online sportsbook service on Godsmejudge) we can move on to the next major horse race. The Run for the Roses arrives in a couple of weeks and we have the list of the 20 horses that will aim to get their hooves in the history books at the 141st Kentucky Derby on May the 2nd. 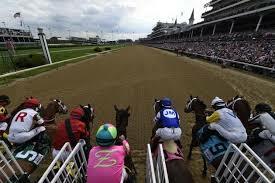 This year security has changed the rules at Churchill Downs and ticket holders will not be allowed to re-enter the grounds once they have left. American Pharoah is one of the Derby favorites this year, and owner Ahmed Zayat has the feeling that this will be his year, after coming in 2nd place 3 out of the last 6 years. Zayat has come close to winning the Derby with Pioneerof the Nile in 2009. Nehro in 2011. and Bodemeisterin 2012. The other top contender in the 141st Kentucky Derby Odds is Carpe Diem, who has never come in worse than a second place finish, has been picked as the favorite at some online sportsbook services.